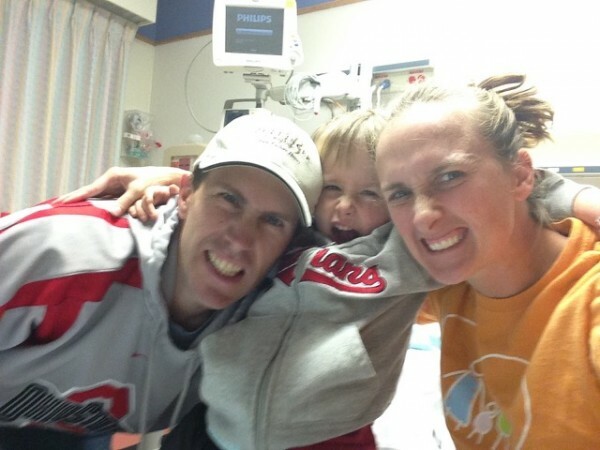 For some reason the ease that we might feel from having Jordan’s shunt replaced was short lived as this was the first he had expressed discomfort after his surgery. The neuro team at Akron Children’s told us there is a high rate of malfunction in the first year. This doesn’t really put your mind at ease as you can only pray that every symptom he demonstrates is not the shunt malfunctioning. Jordan continued to let us know that his head hurt pointing to his incision. I came home from work 5 days after his surgery to have Randy inform me that he had spoken with Jenna, the physician assistant (PA) from neurosurgery. My heart sunk. Jordan’s incision had opened up. As we walked into the ER Jordan requested that we pray for his head. We headed back in to have the incision closed while he was sedated. We could not have asked for a better team as they prepped his IV and researched how best to put our little man to sleep. 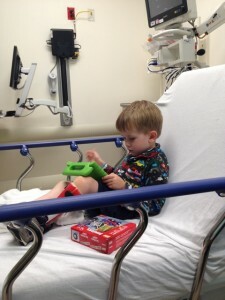 This time around they sent a child life specialist in to help make the experience a positive one for our little man. God is so good! We also shared in a bittersweet moment when we found out that Jenna was going to move to Dayton to be married and start a new adventure in her career. Our myelo team means so much to us. They become part of our family whom we trust as we continue on our journey with Jordan. It’s nice to hear a well-known voice on the phone who is familiar with our kiddos. They are people who Jordan recognizes and is comfortable with. We take time to talk to him about his specialists so they are like family to us. We continued to watch for signs that may lead us back in. 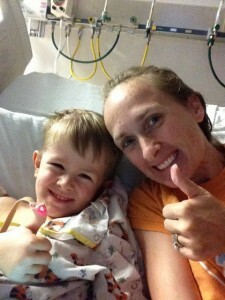 Jordan still did not seem to be bouncing back but at least he was not telling us the new sutures were causing him pain. Two days later after physical therapy we were at a store looking at some items for our house when he suddenly grabbed the back of his head telling us it hurt. This was where he had initially told us he felt like he hit his head on a concrete floor. Back in we went to find that his shunt had again been blocked causing our little man pain. There was concern about infection so Jake, the PA, attempted to take a sample from Jordan’s shunt in our room. However the shunt seemed to be too blocked so back into surgery we went. Dr. Hughes took on the case. She put in a shunt that would allow easier access if they were going to test for infection and the top piece was over to the left side to allow more draining. 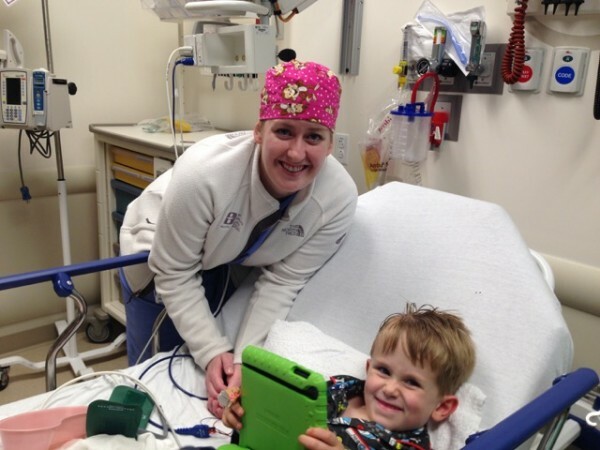 We were relieved to see Dr. Hughes as she came into the waiting area to let us know that the surgery went well. We were also greeted by Dr. Chen after she spoke to another family. 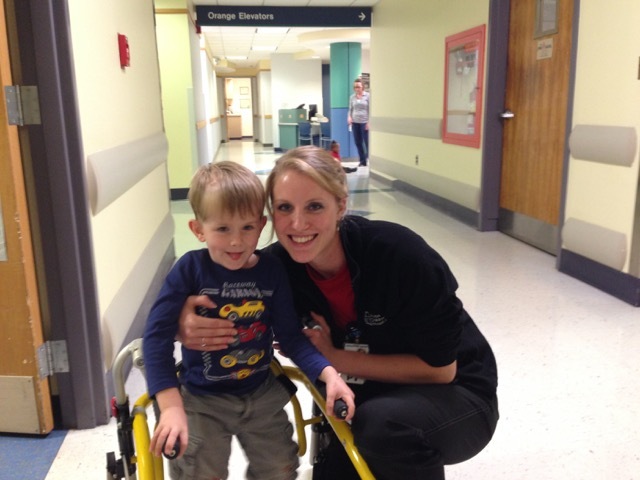 Jordan also had a guest visit from Sarah Brown, his physical therapist. Again we are so thankful for our team who knows our family. Over the next couple of weeks we had a couple of celebrations. Jordan and I went on a date to celebrate his stitches coming out over a milkshake and we met with Dr. Adamczyk, who let us know that Jordan’s hip is looking good. We also wanted to celebrate Physical Therapy Month with a shout-out to Jordan’s PT team: Miss Heather at swim in Medina and Miss Sarah at Akron Children’s. So far we’ve been good. It’s hard when there’s a constant concern if there are symptoms of being a 4 year old or it’s time to go in to be checked. We have to try to remember that though it’s tough to see our little man go through this journey we are thankful to have our team and his silly shunt that saves his life because without it we would not be able to enjoy our little man.